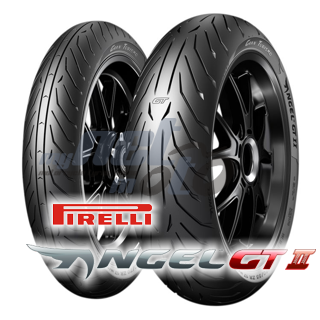 PRELLI ANGEL GT II - Superbike derived carcass construction provides improved handling and increased footprint, especially in an inclined position. An innovative blend ratio combined with optimized carcass materials provide enhanced comfort, durability and consistent performance over the lifetime. One of the most noticeable features of the new profile design is the double-slot in the tread center. (A) Modified carcass version for heavy motorcycles. Touring riders travel on medium to long distances, alone or with a passenger and luggage. They drive sports tourers or modern crossover bikes. It is important to them a high mileage, best stability at maximum load, increased comfort through good damping properties, as well as best security and a lot of confidence even in wet conditions. These riders use their motorcycles year-round as a commuter and as a city vehicle, supplemented by occasional highway excursions on short or medium distances. They drive super athletes, naked bikes, sports tourers or crossover motorcycles. They require control and grip when braking in all conditions, especially in wet conditions, as well as easy handling at low speeds. These motorcycle fans use their bikes mainly for short weekend getaways. They drive mostly super sports and the latest generation of crossover bikes. It is important to them sporty handling, plenty of grip at high mileage, performance in wet conditions and versatility with different payload.